YouTube FLV to AVI easy converter converts your YouTube FLV videos to AVI very easily. Download YouTube FLV to AVI easy converter and check it out! On many occasions, it is very useful to convert our favorite videos from YouTube, Google Video, Yahoo! Video or MySpace (available in Flash Video format or FLV) to other more compatible formats, that we can easily view on any device. To do so, there are plenty of programs, some of which are rather complex. 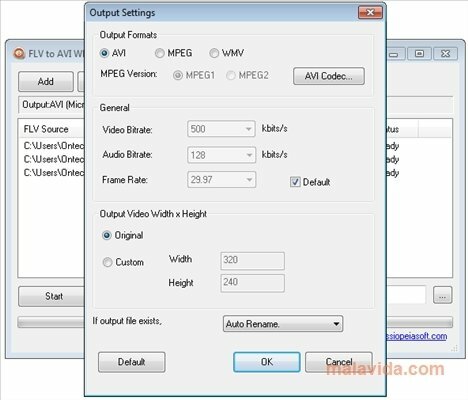 If you want to convert your Flash videos to AVI using a simple program you can always use YouTube FLV to AVI easy converter. 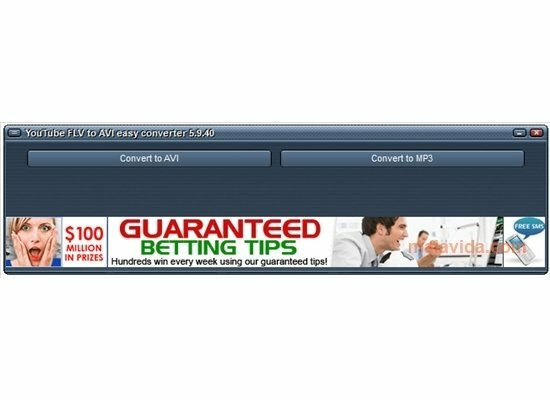 YouTube FLV to AVI easy converter performs, in a quick and simple way the conversion of the Flash videos to AVI. To do so, it uses the MPEG4 codec that it has integrated. All you will have to do is open the video that you want to convert with the "Open" button and press "Convert to AVI". - Support for the following FLV files: On2 vp6 video FLV, H.263, H.264 and audio FLVs. - Adjustable output file size. Check out this FLV format file converter, that's powerful, quick and easy to use!